It says: I was lost – but now I’m Founders. 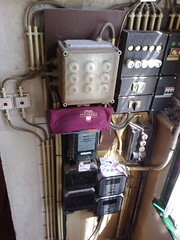 This electricity controlpanel is normally surrounded by a sort of a box. A case you can pick up, so you can have full sight at the panel. Probably it’s not so different from other company’s controlpanels. But I think this 1 looks quite fascinating.